This species was known only from original description by Averincev (1967). 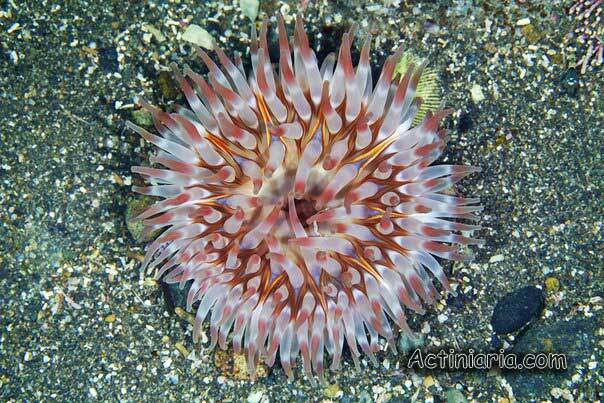 Averincev (1967) described it from South Kurile Islands (NW Pacific) as a subspecies of Urticina coriacea, under a name Tealia coriacea kurila. Since that time this species has been never found again. Averincev’s description is not good. However description of colour model of the disk and tentacles is rather detailed and conform very closely to the colour model of the specimen on the photo reproduced here. So, although the specimen on the photo was not collected and we never examined its morphology, most probably this is Urticina kurila. Note decamerous arrangement of the tentacles (ten tentacles in the inner cycle, ten double orange-yellow radial lines on the disk) - decamerous arrangement is characteristic for Urticina and Cribrinopsis species.